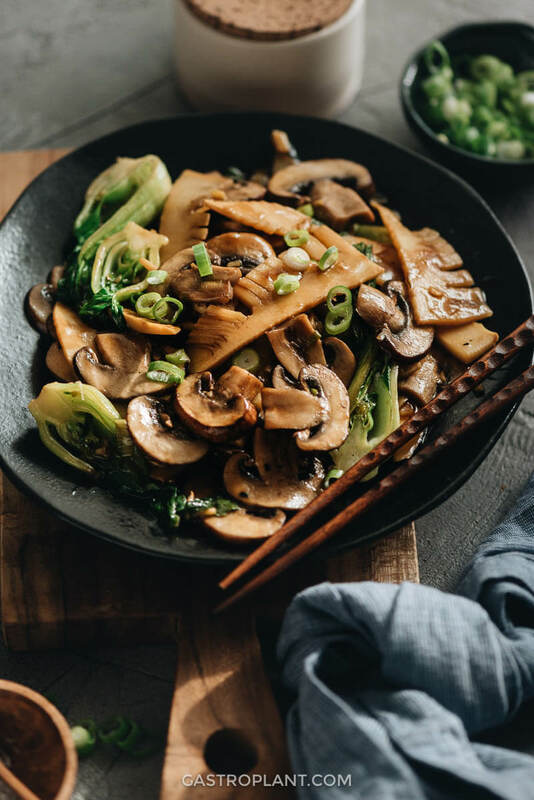 This homestyle vegan Chinese Mushroom Stir-Fry features tender mushrooms, bamboo shoots, and crisp baby bok choy with aromatic herbs and a savory sauce. It’s quick to whip up at a moment’s notice and allows for easy ingredient substitutions. Master this recipe and eliminate an excuse not to eat home-cooked veggies. When I was living in China it was really a challenge for me to cook at home. Not because of anything specific about my home or kitchen or the available ingredients, but because it was so easy and cheap to dine out. And menus there are quite veggie friendly, so it was just as easy to find good veggie dishes as well. A dish of stir-fried potato, eggplant, and bell pepper was one of my favorites, and I could get it in local diners, served over rice, for $2-3. Along with some small bowls of cold salads, such as tofu, celery, or mushrooms, it was super convenient to eat fairly healthy, even at restaurants. Fast forward a few years, once I had returned to the US, local options, even in cities, didn’t really allow me to eat the same way. So I had to find a way to make fast delicious veggies at home. 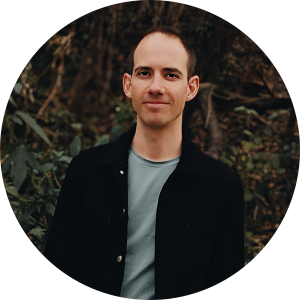 I learned the basic method used to make so many vegetable dishes in China – stir-frying – and it turned out to be a lifesaver. I could pick up whatever veggies looked good at the time (or those that were on sale), bring them home, and cook them quickly and in a way that tasted good. I like stir-frying not just because of the speed, but also because of the flavors and textures it creates. Using high heat, you get a nice blister on whatever you’re cooking. That contrasts with the interior, which is not overcooked but still fresh tasting because of the short cooking time. 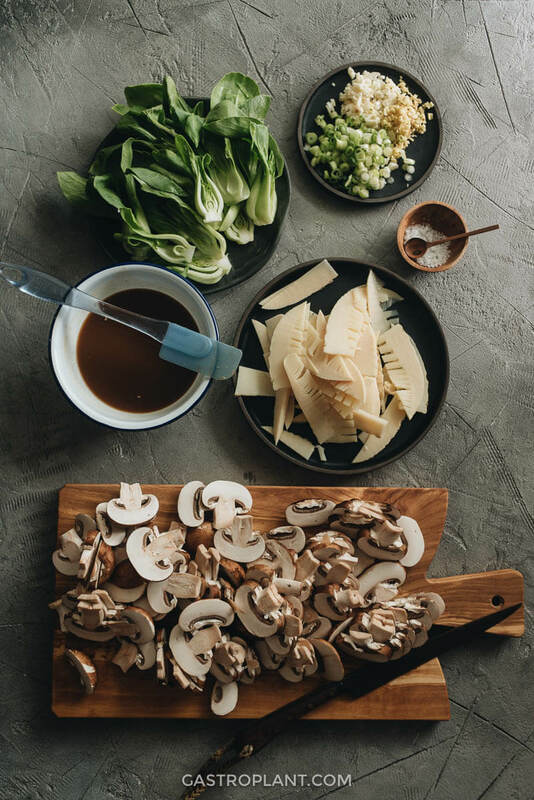 Then, a simple formula of aromatics (almost always ginger and garlic) and sauces (soy sauce, cooking wine, vinegar, sometimes toasted sesame oil) makes a very well-rounded and culinarily complete dish. You can use this technique on all sorts of vegetables. 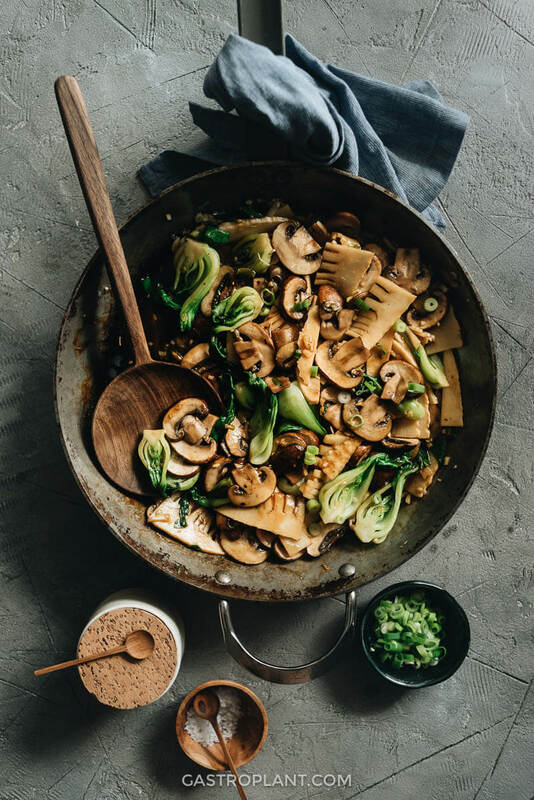 I chose mushrooms, bamboo shoots, and baby bok choy for this one because they are fairly widely available yet still quite Chinese. I also really like the texture of bamboo shoots. 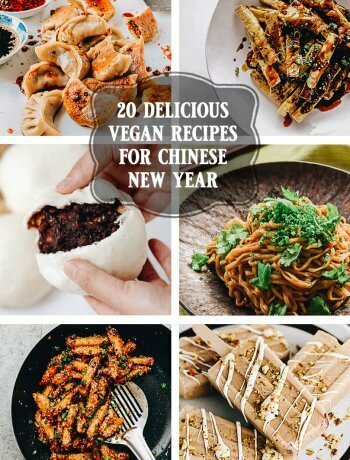 Possible options include broccoli, cauliflower, kale, chard, spinach, tofu, tempeh, seitan, cabbage, Brussels sprouts, onions, carrots, celery, bell peppers, and green beans. 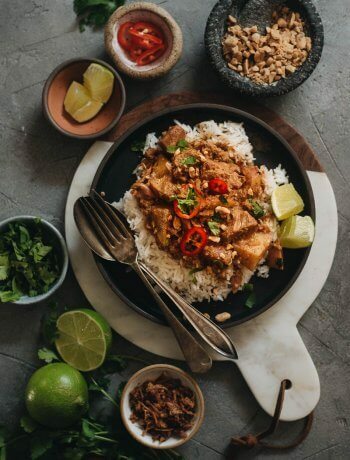 It’s important to understand the relative cooking times needed for each of your ingredients, though, so they will all be cooked through at the same time. 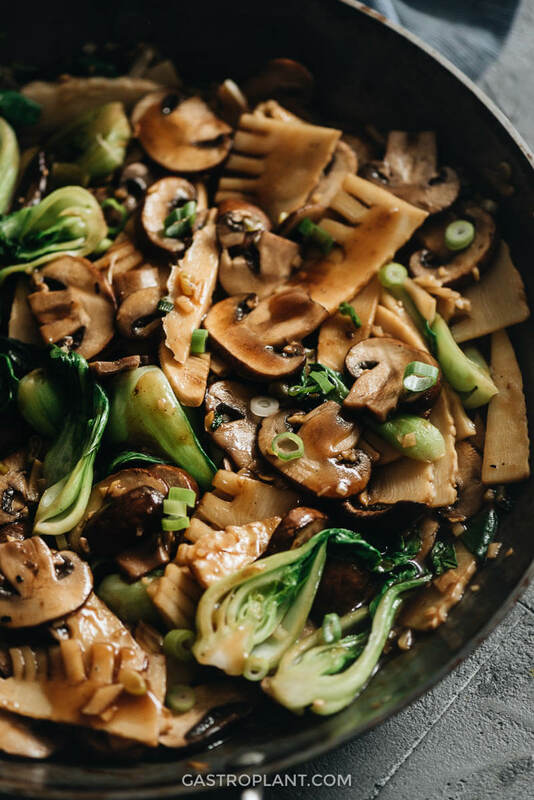 Of the ingredients in this recipe, the mushrooms require the most time, followed by the bamboo shoots, then the bok choy, so the vegetables should be added in that order. Keep this in mind if you decide to make substitutions or additions to the ingredients listed. This recipe and its quantities require a large skillet – at least 12 inches / 30 centimeters in diameter. If your skillet is not that large, you may need to cook the dish in two batches. 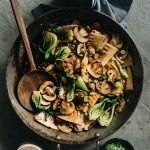 An important ingredient for the sauce in this dish is vegan oyster sauce. It can be labeled in a few different ways. “Vegetarian oyster sauce” is one. “Vegetarian stir fry sauce” is another. These are typically made from shiitake mushrooms. Whether you use Shaoxing wine or dry sherry to cook this recipe, make sure that the wine does not contain salt. Usually, if it says “cooking” or “cooking wine” on the bottle, it contains salt. 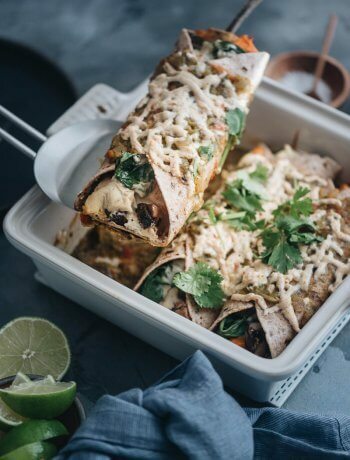 If you try this recipe out, let me know! Leave a comment, rate it (once you’ve tried it), and take a picture and tag it @gastroplant on Instagram! I’d love to see what you come up with. 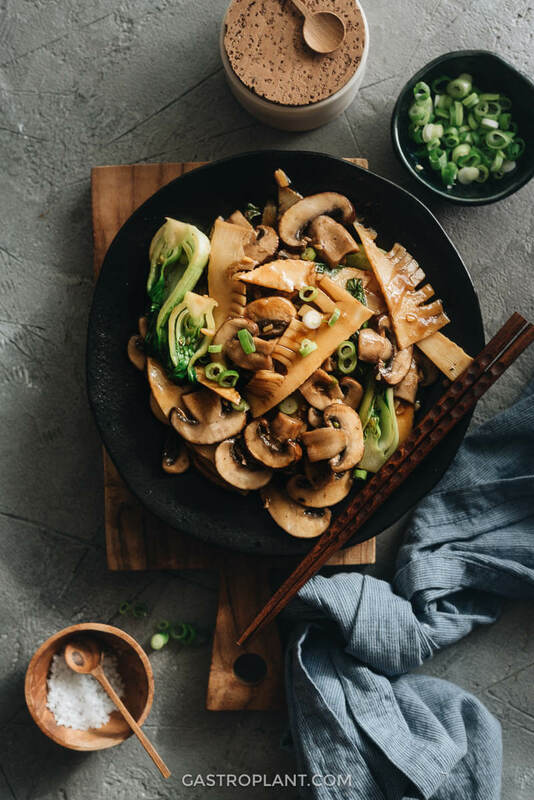 This homestyle vegan Chinese dish features tender mushrooms, bamboo shoots, and crisp baby bok choy with aromatic herbs and a savory sauce. It’s quick to whip up at a moment’s notice and allows for easy ingredient substitutions. Master this recipe and eliminate an excuse not to eat home-cooked veggies. Combine the ingredients for the sauce in a bowl. Stir until fully combined. Heat oil in a nonstick skillet over medium heat. Add ginger, garlic, and green onion. Stir for 2 minutes. Add the mushrooms and stir for 2 minutes. Add the bamboo shoots and stir for 3 minutes. Add the baby bok choy, stir well, cover skillet, turn to low heat cook for 3 minutes. Remove skillet from heat. Give the sauce another stir to make sure the ingredients are well combined. Pour the sauce into the skillet and stir well until it reaches the desired consistency. This recipe produces a bit of extra sauce. If you prefer a less saucy dish, you can gradually add the sauce until it contains the desired amount. This recipe assumes you have a large skillet, at least 12 inches or 30 centimeters in diameter. If your skillet is smaller than that you may need to cook in batches. Vegan oyster sauce can be labeled in a few different ways. "Vegetarian oyster sauce" is one. "Vegetarian stir fry sauce" is another. These are typically made from shiitake mushrooms. There are two types of Shaoxing wine - the regular type and the "cooking" type. The "cooking" type includes a lot of added salt, which will greatly affect the flavor of the dish (it may be inedibly salty). You should use the regular unsalted wine for this recipe. If you substitute dry sherry for the Shaoxing wine, also make sure the sherry does not contain salt.